Microburin looks back at summer 2012 fieldwork and forward to autumn activities. 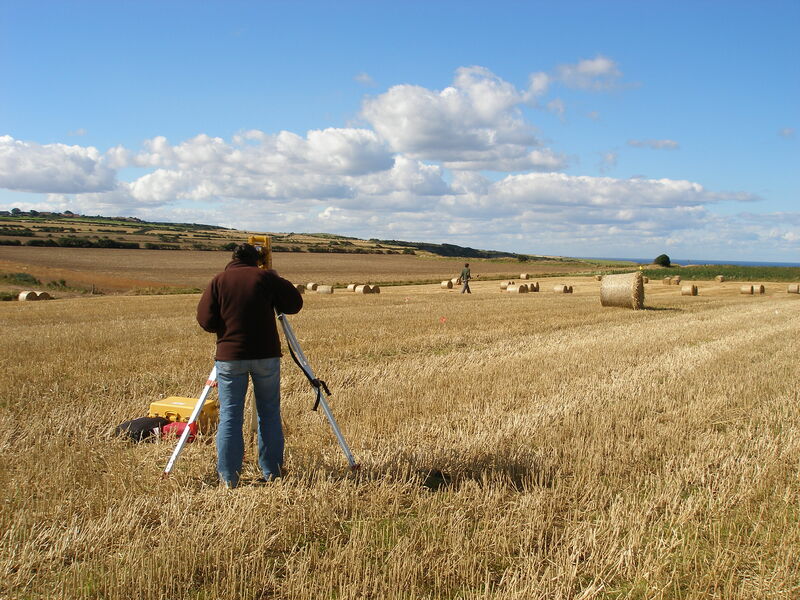 The excavation work near Whitby didn’t happen due to the late harvest and other complications—but field-walking, disciplinarian B&B landladies, Mesolithic pollen coring with professional palynologically qualified palaeo-ecologistical botanists, and more Early Mesolithic discoveries in museum boxes—all did. Oh, and some sublime fish & chips from a man who has worked in the chippy since I was a kid in shorts. That’s an awfully long time and an awful lot of battered cod ago, and remains a top-secret location. While the London Olympics—and the superb Paralympics that followed—remained largely rain-free for the duration, looked upon favourably by a meandering jet stream, the rest of Blighty (Great Britain) was less fortunate. It was indeed a wet summer. Mum had the heating on int’t North and cars became submersibles on several occasions. Andy Murray’s Wimbledon tears only added to an overall sense of moisture. So it was a very late harvest. The viability of the proposed geophys surveying and trial excavations—the third phase of the North-East Yorkshire Mesolithic Project—hung on both the harvest timetable and the impending shooting season, not for grouse here, but a veritable car-boot-sale swarm of partridges all hiding under-cover in a portion of the field especially planted with artichokes. The point about partridges—a Microburin favourite needing a very hot oven—is that they somehow have to get from the artichokes into the sky and then down again into the hot oven. The received wisdom is that this is best achieved by hosting a party of rather wealthy people, of the blue-blooded and merchant banking kind (or Lord Mandelson), armed with shot guns, pointing in the right direction (upwards), and somebody running with flails through the artichokes—over a good six month season. Any self-respecting partridge, you would think, would have the common sense not to sit around for that long. And so there cameth an Edict from the Lord. The chap at the very big house understandably didn’t want an anorak of archaeologists (and likely tree-huggers and sock knitters) messing about in his artichokes. Nor do I think a vortex of heritage-hungry volunteers would want to be in the sights of so many double-barrels, if you’ll forgive the pun? So, birds, lordships, artichokes, rain and the late harvest all conspired. However, all was not entirely lost. Between combine harvesters and bales, a window of a few days allowed the tribe—from Tees Archaeology plus a baking tray of volunteers—to field-walk looking mainly for flints although a few bits of jet were found too. Despite malevolent downpours on day 2, the mission was rather successful. On top of prior geophys results, clear distribution clusters were evident with good indications for Mesolithic activity as well as Neolithic to Bronze Age. Each find was placed in a ziplock bag, marked with a flag, and then surveyed in using a frighteningly expensive prismatic GPS total station—if you were married to one, you wouldn’t let him or her out on their own. The partridges snoozed oblivious to über-quiet walky-talky coordinate gathering and a bit of flag waving. The hope is to reconvene in the spring to complete the project, corpses allowing and kind lordships permitting. 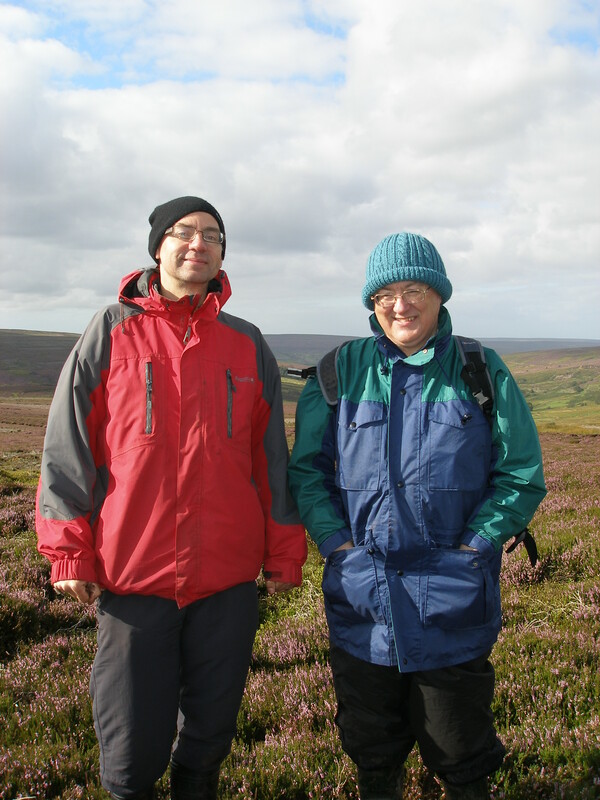 Dear microburins, if you recall earlier posts, the intention was to drag two doctoral experts up onto the high moors at Westerdale, to extract some pollen core columns from a Late Mesolithic site with flints seemingly situated in the peat. This is a very rare, if not unparalleled situation. 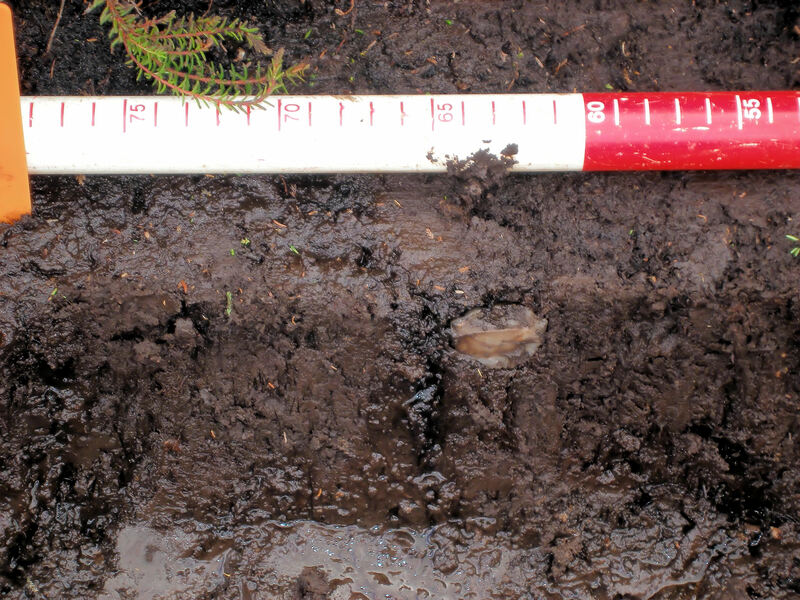 Most Mesolithic flint lay at the interface between the peat and underlying sandy mineral soil and so is not associated with the peat—which began to form in the very Late Mesolithic and early Neolithic as the climate became wetter. The microscopic pollen preserved in peat acts as a proxy indicator that allows the prehistoric environment to be reconstructed and disturbance events, such as burning and clearances, whether man-made or otherwise, to be identified. With luck, pollen sequences can also be dated. Having flint artefacts in the peat starts to provide a direct correlation between human activity and the local paleo-environment. All this was supposed to happen back in April 2012. The week before was so warm and sunny that T-shirts were the order of the day. It was truly like summer, even above 400m altitude. And then the storm. Powerlines and broadband were blown away. It snowed. And it snowed. 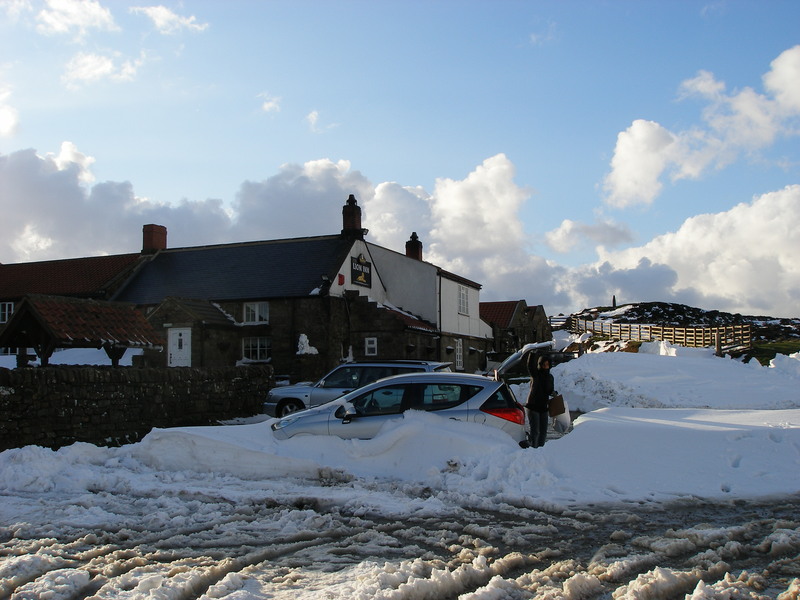 The drifts at the infamous Lion Inn at Blakey Ridge were over ten feet deep. And the beer ran out. As luck would have it, it has been possible to amass a column of palynologists—well two of them—a car full of shovels, tins, guttering, ranging poles, tin foil, cling film and a trowel or two. The fantastic local game-keeper arranged for gates to be opened, and off we drove around the head of Farndale on the old ironstone railway trackbed. It’s an awesome drive, dodging walkers, sheep, grouse, but not partridges. Doctors Jim Innes from Durham and Jeff Blackford of Manchester, proved great company. 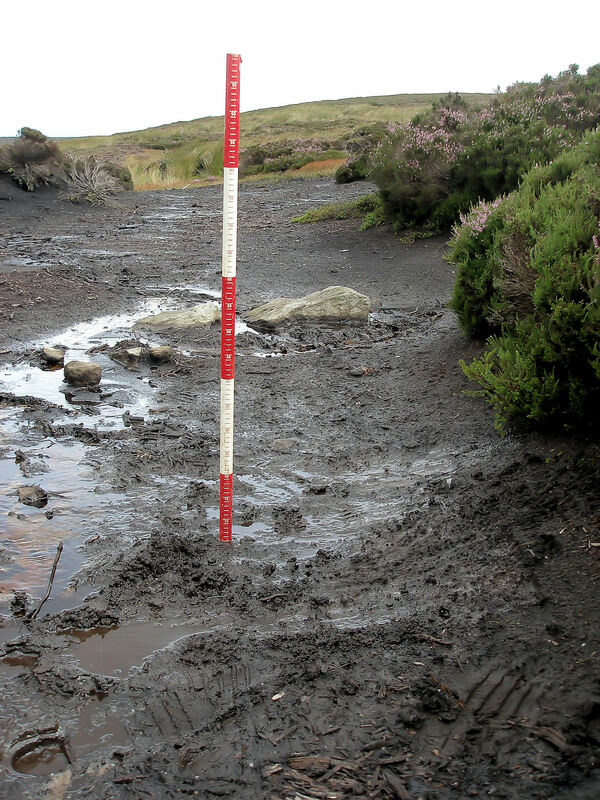 Mum arranged with “certain powers” to have the torrential rain turned off at 11am on the last day of August and, after building dams and removing sticky gloop, flints-in-peat is exactly what we found. We managed to remove four pollen columns with flints embedded in each. Over the coming several months, these will be cleaned, analysed and assessed for AMS dating potential. 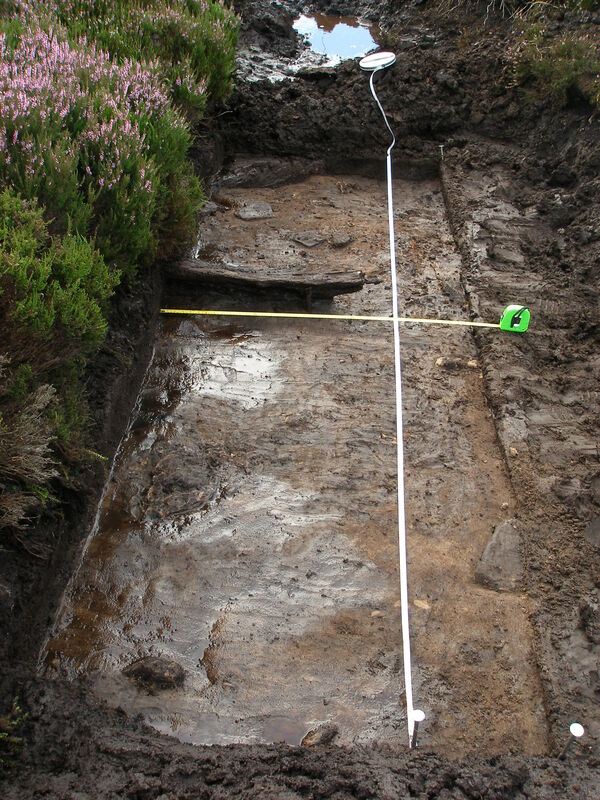 A sample taken in 2009 about 10m further up-slope dated the base of the peat to the Late Mesolithic (Innes, pers comm). 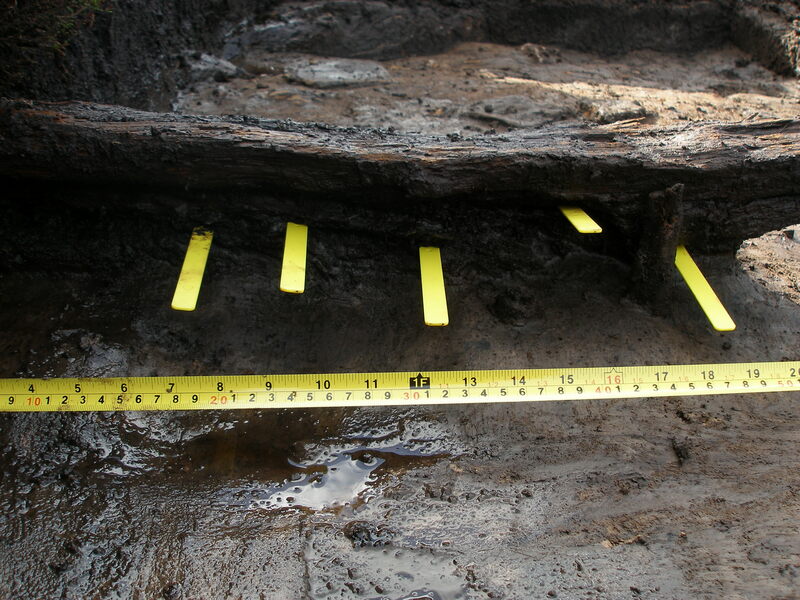 I returned to the site the a few days later to re-clean about 3 square metres of the section and explore a timber fragment protruding from the peat with some vertical birch stems sitting to the side. Over the entire day, thankfully a dry one, the area was cleaned up, planned and photographed. The vertical “stakes” proved to have nice little root systems and so, with the clay laying around, seem to have been growing in a damp hollow—one could see the tiny sections of reeds as black flecks in the clay. Yellow markers for the flints underneath the timber. The timber remains somewhat elusive (and is now protected and back-filled). It could be a root, a fallen trunk, but retains an odd profile and rather bulbous right (exposed) terminus, although exposure and erosion (this is a footpath) could account for this. It lay in the peat too and had a layer of flints, mostly debitage but potentially one microlith, directly beneath it. These join about 100 flints previously recovered and are in the process of being catalogued as part of the White Gill and Esklets project. So far, the microliths are only straight backed bladelets (not rods) and the debitage overall is homogenous, with several refits, suggesting little large scale movement of flints since deposition although the site is located on a gentle slope. I’m writing up* the coring and excavation exercise for HER and ADS archives and ready for the palaeo-environmental analysis results as and when those become available. After this exercise, in mid-life, none of my body parts would function for a week, and I developed a very big and painful spot on my nose (named Jehovah). Back-filling is a moral duty that exacts a heavy price on the physical being. The following day, in lovely sunshine, I was met by a local farmer—sheepdog attached to the back of his trike—who shared his flints, spoke in rich “Nordic” Yorkshire dialect, and whose sheepdog, named Ben, shook paws with me. Treasured moments. We talked to several local picnicers about ancient people, long-gone forests and beasts of the woods. I don’t think anybody would want to upset a bos longifrons? * Same format as a commercial “grey literature” watching brief / excavation record, hopefully uploaded into the OASIS project repository managed by the Archaeology Data Service (ADS) based in York. 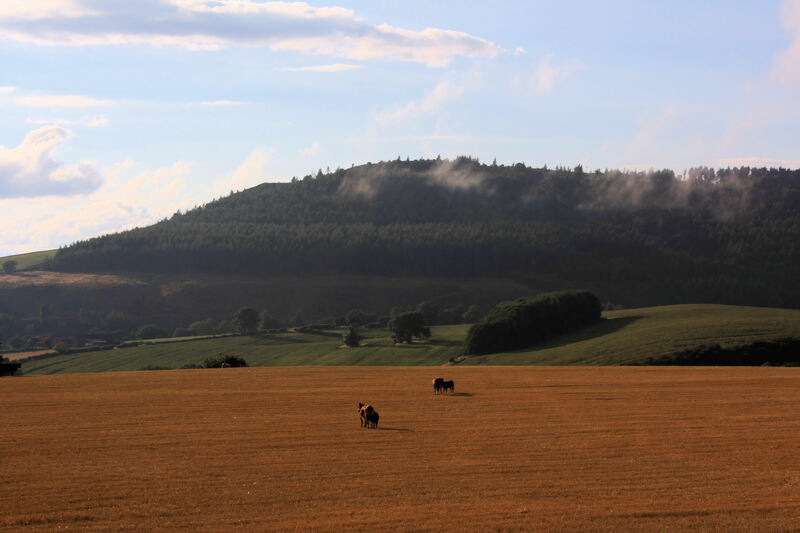 North York Moors National Park Authority pre-approved the work (core extraction and section recording) and permission was gratefully received from the Farndale Estate who provided access. * If you’re new to British prehistory and flint technology, I’d highly recommend Chris Butler’s Prehistoric Flintwork (Tempus 2005, affordable and widely available) is an excellent one-stop reference. 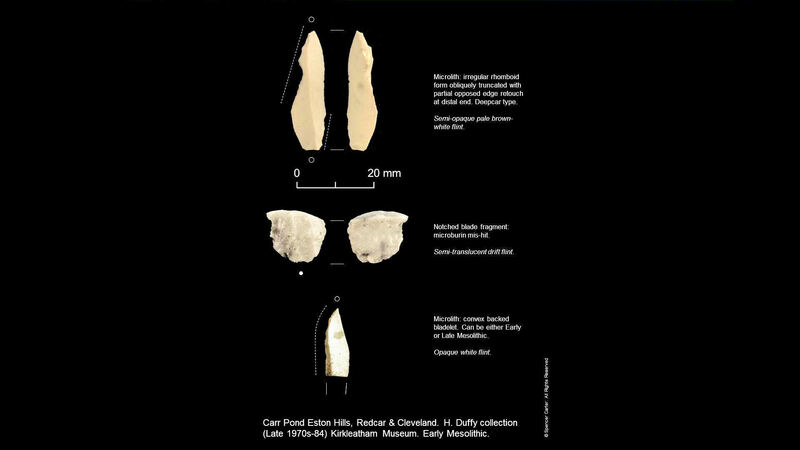 The Mesolithic section is especially useful with a summary of microlith and major tool form typolologies. 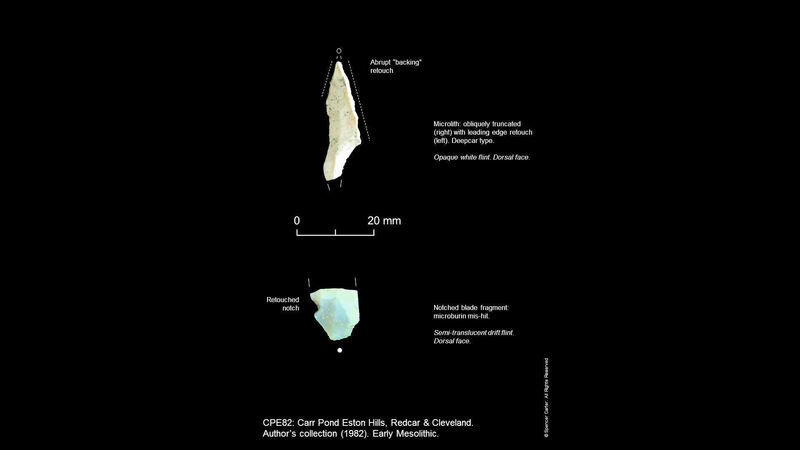 The rendition of Roger Jacobi’s microlith typology is covered on pages 94-6 and there’s a good summary of Early Mesolithic and Late Mesolithic chronological patterns—including the “Star Carr” and “Deepcar” types. What we can do now is add, with increasing confidence, the northern-most activity area that is immediately south of the Tees basin, on the Eston Hills c. 200m altitude that quite dramatically overlook the Tees Estuary and south Durham coast—perhaps offshore wetlands and forests in the Mesolithic, for which there is published evidence. On clear days you can see as far as the Pennines to the west, and southwards towards Highcliff and the North York Moors escarpment. 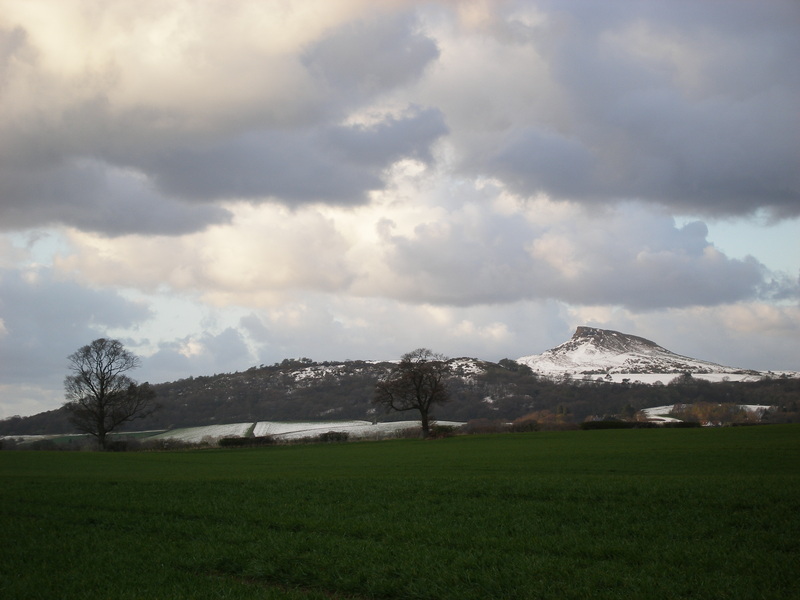 Roseberry Topping would, as it does today—albeit after historical landslips that precipitated a fine Bronze Age hoard (in Sheffield Museum)—appear prominently in a Mesolithic vista even given heavy deciduous forestation at the time. I guess that’s why it appeared in a recent branded wholesome bread advert on TV last year? 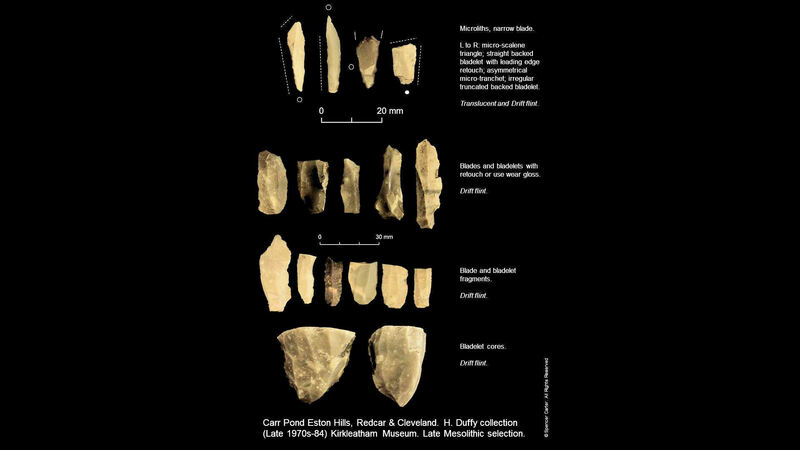 Our postulation, in summary, was that a particular assemblage recovered by your dearest Microburin writer in 1982 (site CPE82), contained an Early Mesolithic “Deepcar” type microlith of broad blade form. This is in addition to blades (and virtually no debitage—most stuff seems to show utilisation and edge wear) whose characteristics are not only different to the general Later Mesolithic assemblages but had much more in common with other early finds in north-east England and the Pennines, if not farther north —Clive Waddington’s landscape work in the Millfield basin and the Borders. Colleagues have, meantime, confirmed the microlith typology, and more is to come. Excited? Do please read on. A central aspect and enjoyment in any archaeological exercise is researching the activities of our immediate antecedents—the people who have walked the hills and recovered artefacts, here flints, no matter what their interest point. Much of our archaeological record and museum collections bear homage to the wanderings of curious people (by nature and outlook) within the wild landscapes they enjoyed. Historiography—recording these earlier adventures—is as interesting as making sense of what they discovered. From 18th and 19th Century antiquarians who dug barrows for treasure and sought proof of evolution by way of pejorative views on human and cultural development (small flints were made by small pygmy people), to the ladies and gentlemen who have enjoyed their hills and valleys up to the present, all of these explorers have picked up things that have seemed odd. Some recorded their find spots, some still do extremely well. Others leave vague records, but ones that can still build up a storyboard of human presence and activities over millennia. We cannot undo the foibles of our friends in the historical past, only make the best of what they have bequeathed to us. Enter Mr. H. Duffy from Redcar of which nothing is known except a box of flints, a map made with a sextant, two diaries and a photograph, all in the Kirkleatham Old Hall Museum*. 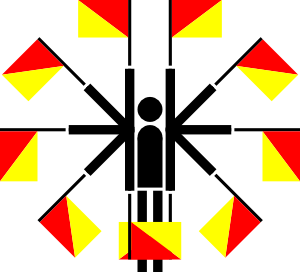 He seems to be an eccentric gentleman who very much preferred his own company—he notes “troublesome student types” with binoculars (one being of non-caucasian complexion), a vicar, a birdwatcher, nuisance security guards at the ICI Wilton Castle headquarters. His map was completely home-made over probably a decade from the mid-late 1970s to 1984. He also, partly endearingly and partly frustratingly, made up names. 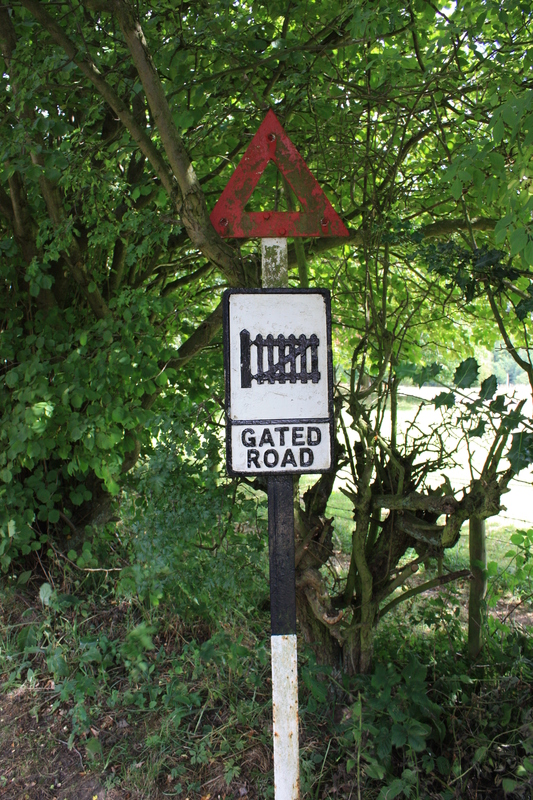 He gave street names to footpaths, called the burnt area where most flints came from “The Paddock” and invented “Stonegate Farm” which doesn’t exist as a farm—it’s two stone gateposts (stonegate) and a ploughed field (farm). But Microburin knows the place and gate posts very well. “Rosebay Heap” is where he built a small cairn as his central “datum” point. It was constantly “vandalised” by the wandering youths, poor chap. This was also a time, remembered by Microburin himself, when some devastating fires removed huge areas of vegetation and peat. From the sandy mineral soil he picked up flint artefacts, but unfortunately didn’t plot all the find spots. Nevertheless, his collection provides evidence for prehistoric activity from the Early and Late Mesolithic to the Bronze Age. He also picked up shrapnel and bits of discarded clothing—anything out of the ordinary. He records his moods too, varying from “Felt much better after MGN [unknown: mighty good nap?] and a rest” (Tue 5 July 1983) to “Morale very low… old paranoia again” (Sat 27 Aug 1983). It also took extremely bad weather to put him off. * I’m extremely grateful to Peter and the gang at Tees Archaeology for allowing me to look at the Duffy archive, make records and take photographs. Peter also kindly provided a scan of the Duffy map. CPE82 | Compare Duffy’s flints (top) with the author’s (bottom) | Good match? 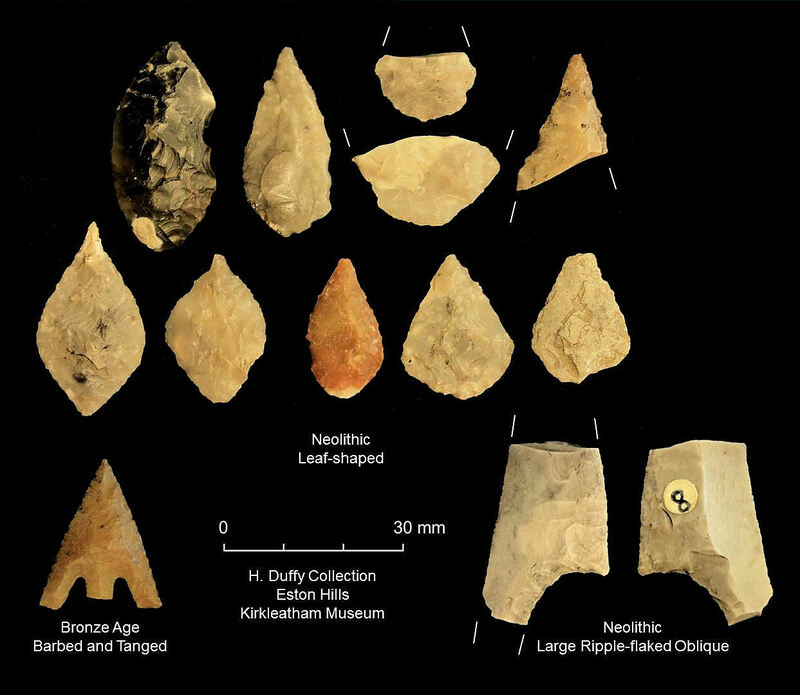 In addition to a fine array of Late Mesolithic “narrow blade” microliths—bladelet cores, blades and debitage too—a series of lovely Neolithic leaf-shaped arrowheads plus a very fine, large ripple-flaked oblique arrow, an extremely beautiful and large Bronze Age barbed-and-tanged arrowhead, and wide selection of scrapers, retouched tools and the like (perhaps for a later post)—one particular group of flints stand out. Whilst he didn’t record the exact location, there’s another broad-blade microlith (or two), this time a slightly irregular rhomboidal obliquely truncated blade, with backing retouch on both margins. Again, it has close parallels in Deepcar type* assemblages. This is accompanied by blades and flakes, many with utilisation wear, and microburins virtually identical to my CPE82 assemblage. The raw material, largely white “Wolds” flint and some patinated Drift flint, is all identical to CPE82. 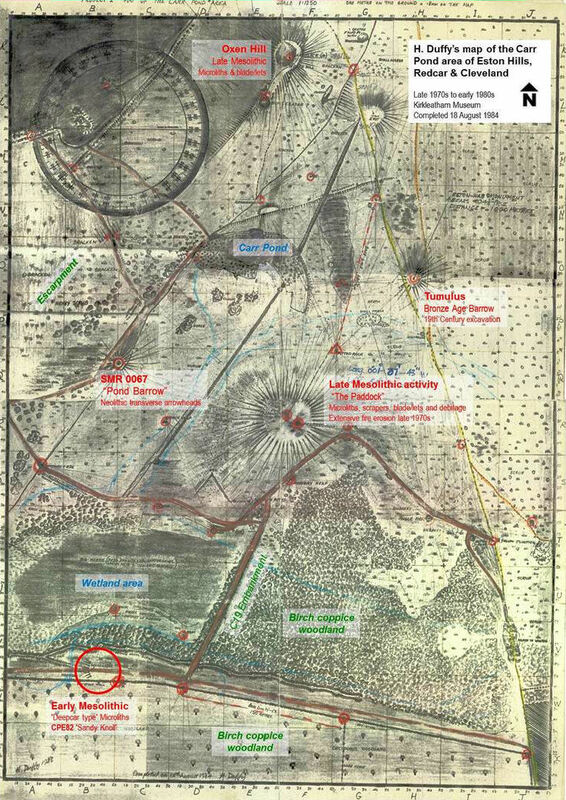 * A quick scan of the literature shows similar examples at Warcock Hill North (Pennines), Oakhanger VII and Wawcott III amongst others. As the evidence grows, I don’t think the Early Mesolithic folks were here at Carr Pond very long, at least in this place. 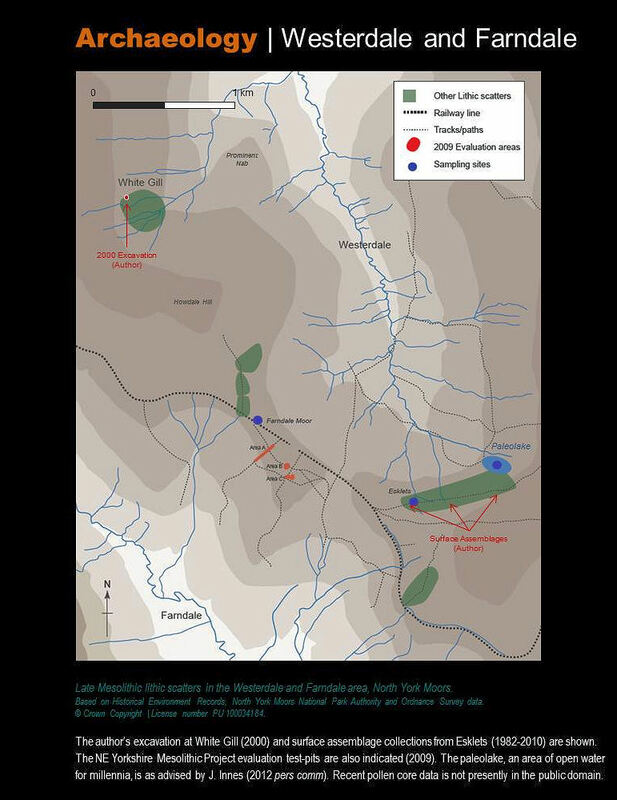 It doesn’t so far seem to be a “persistent place” as we have in the high uplands, and as we may have in the Later Mesolithic on Eston Hills and Upleatham. It does not seem to be a spot of primary flint knapping either. There’s little debitage, a majority of used blades and flakes. But there’s enough evidence by way of three or four microburins that they’re perhaps repairing toolkits using blank blades or prepared-and-tested pebbles—you don’t want to be carrying around heavy cobbles of dubious quality, not through forests and scrub. 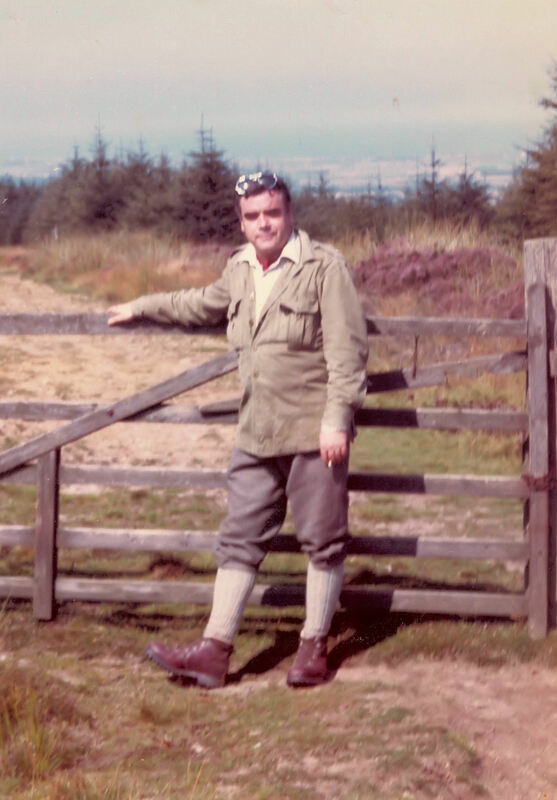 Don Spratt (1922-1992) was an enthusiastic “amateur” archaeologist who spent his retirement years working in Cleveland and the North York Moors with the likes of Raymond Hayes. 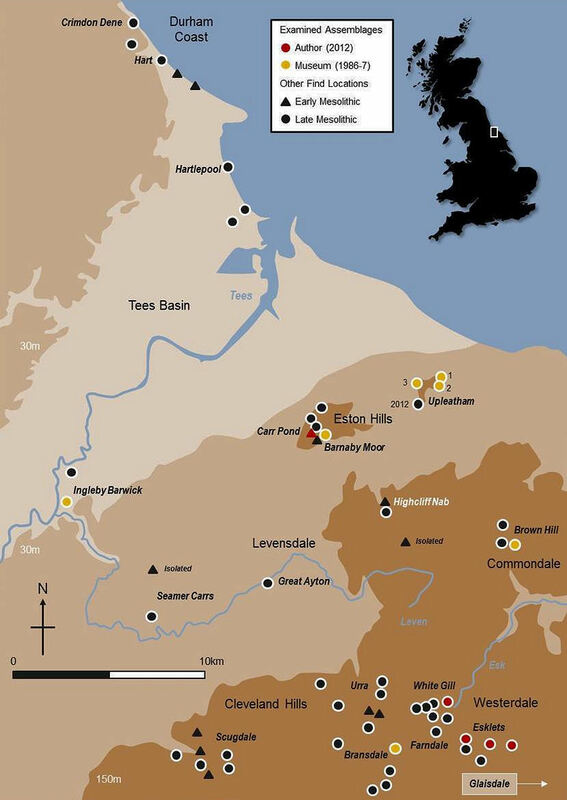 His most visible achievement, the Prehistoric and Roman Archaeology of North-East Yorkshire, remains a central resource for anybody studying the north-east of England. 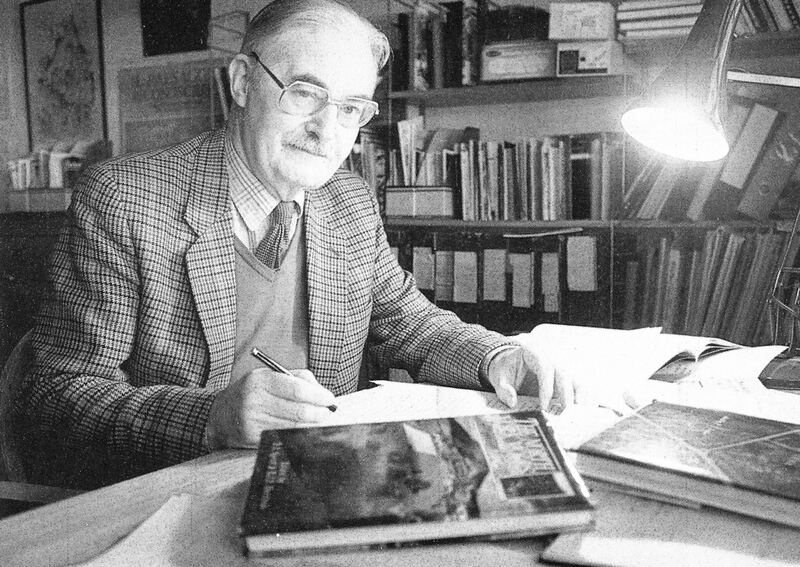 With friends he recovered and published the Upleatham Mesolithic assemblages and his excavations over many years at Roxby Iron Age settlement, published in PPS, won a major award. 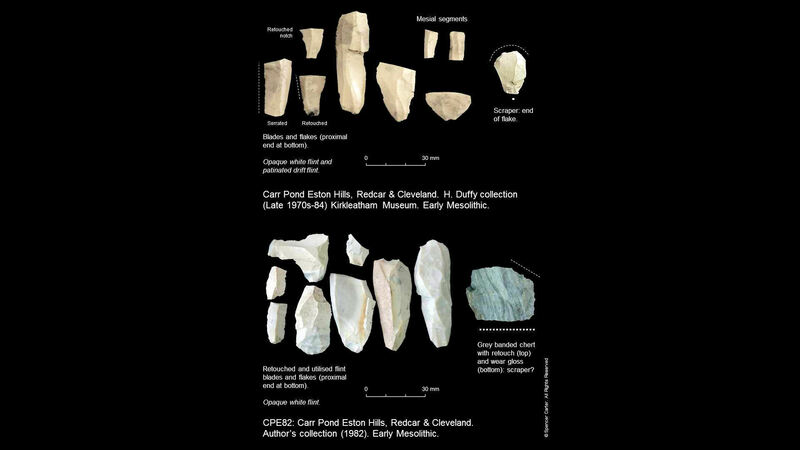 A good deal of his Cleveland finds are in the Dorman Museum, Middlesbrough and include artefacts recovered by field-walking on the Eston Hills. Microburin is heading to the museum next week to follow-up on previous observations that some broken broad blade microliths are present in his collection. The ploughed fields at Barnaby are very close to CPE82. It’s going to be very interesting to see if this adds to the unfolding story of early post-glacial Teesside. 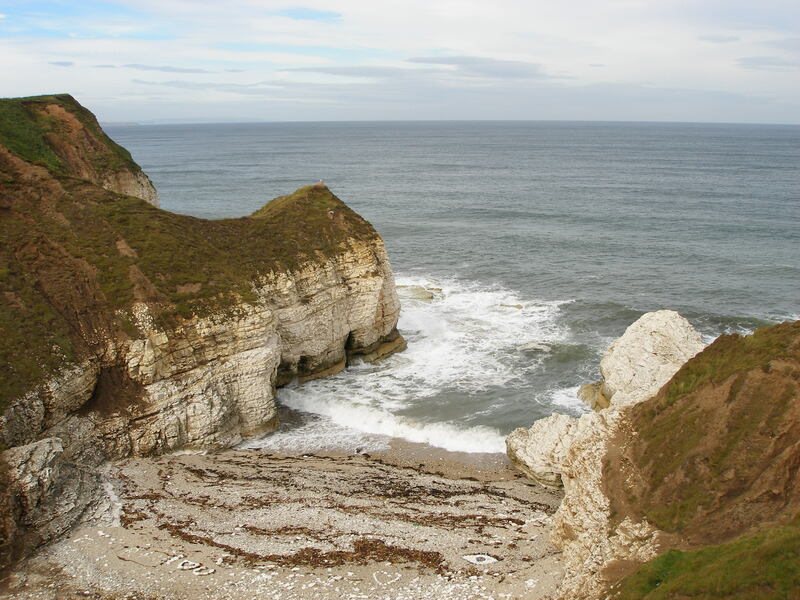 The final ritual act of this summer was a visit to Flamborough Head, East Riding of Yorkshire, to scramble around the coves, cliffs and boulder clay in search of reference sample flint pebbles. There’s no problem finding them in the same way there were no problems for our Mesolithic friends. What Microburin found is identical to much of the material from the high moors, but missing some of the brighter coloured material—the reds, oranges, deep browns, pinks and finer translucent flints thought to occur more on the Durham coast. The layer of opaque cream-white flint in the chalk is very similar to the CPE82 assemblage. Interestingly, only very small pieces of stained flint occurred in the glacial till, and some of the larger cobbles that would be considered drift flint look like they’re in a primary deposit or derived from offshore chalk beds in the immediate vicinity. I’m sure there’ll be more on raw material sources in 2013. Let me leave you with a final picture of more later prehistoric artefacts in the Duffy collection. This entry was posted in British archaeology, Digs, Events and activities, Hunter-gatherer-fisher, Lithic analysis, Mesolithic, Microburin miscellaneous, Projects, Sites and finds and tagged Archaeology, Bronze Age, Deepcar, Eston Hills, flints, Mesolithic, Microlith, Neolithic, Palynology, Prehistory, Social Sciences, Teesside, Whitby by Spencer Carter. Bookmark the permalink. A fantastic read, thank you very much for posting! Cheers! Perhaps a slightly different take on the Mesolithic? 🙂 Much enjoyed your “commercial archaeology” piece too. Ey Lad, thermals… PS do share word about Microburin. Maybe I can make a career shift from sales ops to damp places? The inner child has gotten into my head too! Indeed! I have also linked your blog on my list, and I’ll be sure to mention it in an upcoming entry. Ah thank you, though the credit must got to Charlie Hay for the entertaining piece! Yes, never forget thermals!